InBin keeps packages safe & secure... package thieves away... protected from the elements... you connected to your deliveries! 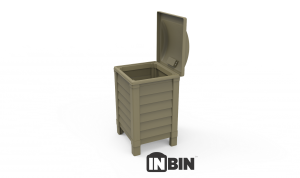 For media & press – we welcome media inquiries about our InBin Parcel Box & InBin IQ technologies.The following press kit contains multiple videos, pictures and photography to help you present the InBin properly against the competition – which is surprisingly missing. The following InBin is a project in the making for nearly two years. The team is dedicated to solving challenges today’s consumers face with deliveries of many kinds. InBin and Ending Points is focused on emerging logistics and technology leveraging IoT, Blockchain, Smart Home, Mobile Apps and other technologies to connect users with their deliveries. We welcome interviews, quotes, use of our drone footage, package delivery and package theft video and photos for use in your publication, newspaper, blog, or newscast. If you’re on deadline and need to reach someone immediately, please send a text message to us @ (267) 875-3150. For general inquiries or to document usage of our copyright materials, please email direct with the publication or website, media or press and person’s contact details to PRESS @ INBIN.CO. During CES2018, InBin reveals details on the first smart home delivery system for mail and packages. Consumers can protect their packages and stay connected through mobile and smart home assistants like Google Home and Amazon Alexa. InBin kicks porch pirates to the curb, keeps home owners connected to their deliveries. Now that Christmas is over and many have experienced package theft, tampering and misdeliveries, the InBin comes along to solve these problems and more – coming in ’18. Footage and usage rights are property of InBin c/o GMGMG, LLC. Subject to Creative Commons license, Attribution 4.0 International. InBin press kit for media relations. Find the latest press releases on the company, service and delivery technology.